"Have I mentioned lately how much I love my @Drobo? #icansleepatnight"
The Drobo 5C is the latest generation of the award-winning platform that started it all. It holds true to the unique design and simplicity that has made Drobo the best desktop storage solution for storing and protecting all your data. Whether you are at home or in the office storage expertise is not required to ensure your data is always safe and protected. It includes the state-of-the-art USB Type-C connector for a simple way to attach the Drobo to your PC or Mac. USB-C is compatible with both USB 3.0 and USB 2.0. Inside every Drobo is the revolutionary BeyondRAID storage technology that protects data against a hard disk crash, yet is simple enough for anyone to use. As long as you have more than a single disk in Drobo, all data on Drobo is safe no matter which hard disk fails. There’s no need to worry about anything else. Here are some Resources to help you choose the perfect Drobo. Our 4 easy steps to help you choose the right Drobo. Approximates the space utilized with various mixed disk configurations. Balance acquisition costs and performance requirements vs. capacity requirements. When it comes to upgrading your Drobo to a larger or newer version, you have several options. Built on our award-winning BeyondRAID technology, the Drobo 5C protects your data without any intervention – even in the event of multiple drive failures. You can even switch from single to dual disk redundancy with a single click, ensuring enterprise-level dual parity data protection when required. Drobo’s with BeyondRAID are also self-healing and have virtual hot-spares. If a drive happens to fail, Drobo will automatically re-layout the data to return to a protected state without disruption. 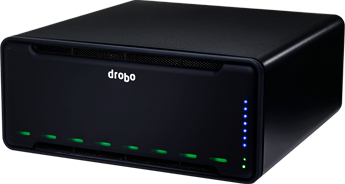 Drobo takes the up front guess work out of determining the amount of capacity you require. Buy the capacity you need today, and when you need more storage, simply replace your smallest drive with a larger one and immediately use that capacity in seconds. You can even mix and match drive brands, capacities and speeds. To further enhance your experience, every Drobo comes with Smart Volume technology. Smart Volumes™ are thinly provisioned volumes that automatically utilize capacity as needed from a common pool of storage. Additionally, as data is deleted, free capacity is returned to that common pool, immediately increasing the available capacity. Apple’s Time Machine was designed to make backing up your files simple and painless. Pairing Time Machine with Drobo improves your data protection by ensuring your data is safe in the event of hard drive failure. Apple’s guidelines are to set the storage space for Time Machine at twice the size of the Mac’s hard drive that is to be protected. Time Machine users know that it will gradually use all available disk space without an easy way to stop this from happening. 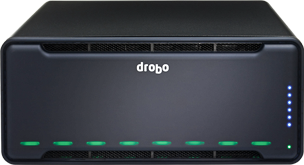 With Drobo you can easily control the maximum storage space available for Time Machine backups through Drobo Dashboard. When you install a Drobo, Drobo Dashboard prompts to see if you want to create a dedicated storage volume for Time Machine’s use, allowing you to set the size of this volume. Once you experience how easy it is to use a Drobo you’ll know there is nothing that compares – but that isn’t the only remarkable thing about it. Drobo takes upgradability to the next level. Not only can you upgrade capacity with no downtime by adding new drives or replacing smaller drives with larger ones, you can seamlessly upgrade to a new Drobo 5C by simply removing the disk pack from your current system, and moving it to a new Drobo 5C. Upgrading not only gives you an instant performance or capacity boost, but also delivers all the other benefits of the new Drobo. The Drobo 5C doesn’t just protect you from a drive failure, but also from potential data loss after a power outage. 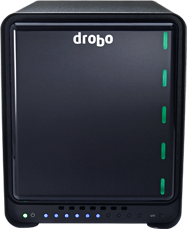 In every Drobo we include battery backup technology that protects all data in memory or cache. When power spontaneously goes away, Drobo moves any in flight data to onboard flash in your Drobo so it will be protected and moved to your disk drives once power is restored. This ensures your important information is safe and sound. Even better, your battery recharges itself and is designed to last for the life of your Drobo 5C. Up to five (5) 3.5″ SATA II/III hard disk drives (sold separately). Drives of any manufacturer, capacity, spindle speed, and/or cache can be used. No carriers or tools required. Click here for drive recommendations.